Covers Hampton Wick. 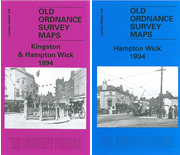 Note that this 1934 version does NOT include Kingston and the area east of the Thames. Incl Merton Park. Area south from Wimbledon station. Includes Norwood Junction, Portland Road Brick Works, Werndee Hall, South Norwood Potteries and Holy Innocents Curch. Includes Elmers End, South Eden Park, Elmers End Station, St James' Church, Part of Crystal Palace District Cemetery and Kelsey Manor. Covers Beckenham Golf Club House, Woodside Green, Woodside Station, Holy Trinity Church, Selhurst Station and Convent. Covers Wandle Park, Duppas Hill, Town Hall, St Matthew's Church , Railway Station, Bramley Hill House and Cricket Ground. Covers Addiscombe Farm, Coombe House, Coombe Lane Station, Shirley House, St Mary Magdalene Church and Parkhill House. Covers Haling Park, South Croydon Station, Haling Road Hall, South Croydon Recreation Ground, Selsdon Road Station and St Augustine's Church. Covers Croham House, Croham Farm, Ballards, Coombe Lodge, Fox Farm and Addington Reservoir.